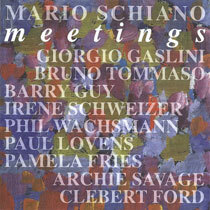 Mario Schiano, alto saxophone, organ (tracks 4, 5); Giorgio Gaslini, piano (track 1); Brumo Tommaso, double bass (track 1); Pamela Fries, voice (tracks, 2, 3); Irene Schweizer, piano (tracks 2, 3); Phil Wachsmann, violin (tracks 2, 3); Barry Guy, double bass (tracks 2, 3); Paul Lovens, drums, cymbals, percussion (tracks 2, 3); Archie Savage, voice (tracks 4, 5); Clebert Ford, voice (tracks 4, 5). Track 1 was recorded at Controindicazioni 7 Festival, Colosseo theater, Rome on 8 October 1993; tracks 2 and 3 were recorded at Controindicazioni 6 Festival, Colosseo theater, Rome on 16 October 1992; tracks 4 and 5 were recorded at Folkstudio Club, Rome on 26 January 1980 for the Folkstudio 20 television show. Cover (reproduced above) by Peppo Spagnoli.